When it comes to achieving high-impact printing results at home or work, our extensive range of high performance Samsung Printers will allow you to enjoy clear visible printing results, as well as detailed images and graphics that are of exceptional quality. Our range of printers has been designed to meet your day-to-day printing needs and deliver the highest quality printing results, whether you’re printing out an important document for work or even high-definition images and graphics for school or college. But that’s not all, our quality range of Samsung printers embrace the latest state of the art technology, allowing you to enjoy features such as Wi-Fi and NFC connections, Apple AirPrint, Google Cloud Print, and easy mobile printing. 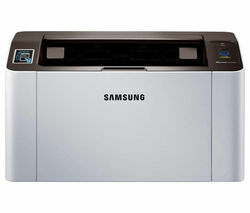 Majority of the Samsung printers in this range accommodate high capacity ink cartridges, helping you to cut costs and accommodate big printing jobs. Embracing wireless technology, most of the items in our Samsung printer range will allow you toprint important documents from your phone and other mobile devices on the go by connecting your phone to your printer, so you can stay productive, no matter where you are. So, whether you’re looking for photo printers or a multi-functional printer that can meet all your printing needs, you’re in the right place. If you’re looking for a high performance scanner, make sure you check out our scanners collection, too!